SerieAForums • View topic - Miko Romane...galleria di arte! Individually, it could be argued that these three guys, Thomas Berthold, Thomas Haessler, (or HÃƒÂ¤ÃƒÅ¸ler to use German abbreviation) and Rudi VÃƒÂ¶ller... though undoubtedly all good players, weren't really Roman icons. They are however part of my fonder Roma memories and a relevant part of our history. 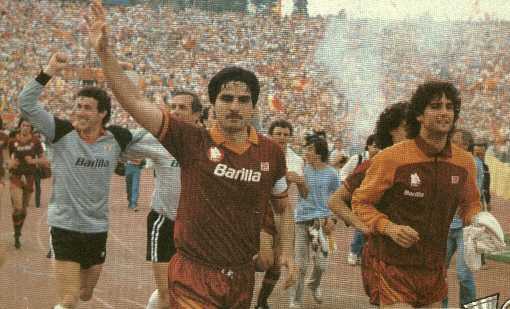 However, the only trophy we won during their time with us was la Coppa Italia, season '90-'91, in which VÃƒÂ¶ller and Berthold played their part. The first, and the most popular of the three to come to us was of course Rudi VÃƒÂ¶ller. 1987 - 1992, 45 goals in 142 appearances. 45 goals in 142 games may not sound all that great but it's a sight better than some of our so-called strikers have managed! Quite aside from what he did for us on the football pitch, he made many friends in Roma and Italia, having a pleasant personality. He then spent two seasons with Marseilles before returning to Germany, signing for Leverkusen. Though there are probably only four of us here who remember his playing days for Roma, a number of us here will remember, following his resignation from the German national job, he briefly made a comeback with us as allenatore in 2004 as a last-minute appointment after the shock resignation of Cesare Prandelli. He left us only one month later after a series of poor results and high-profile disagreements with players, notably Antonio Cassano. Thomas Haessler, the second most successful member of the trio was signed after one season at Juventus. 1991Ã¢â‚¬â€œ1994, 11 goals in 88 appearances. If his time with la Juve didn't live up to some expectations, he fitted in just fine with us. For my money, one of the better wingers to ever play in Italy. Part of the thinking in signing him was that if Milan had their Dutch trio and Inter their German one, we could have our particular version, but as Berthold decided to go to Bayern, that didn't happen. The above pic flatters him...he looks more than his 5'5Ã‚Â½" but in his case, good things did indeed come in small packages to quote the old saying. When he left us in 1994, he returned home to Germany, signing for Karlsruhe. Thomas Berthold, 1989-1991, 3 goals in 62 appearances. He joined Verona two years too late in 1987 when they were starting to slip after their fine Scudetto win and stayed there until 1989 when he joined us. His claim to fame was in being the West German(as then was) national team captain and a fine defender by any standard. When Bayern asked him to join them in 1991 he wasn't going to refuse. Our version of a German super trio didn't work out but as Meatloaf once sang, "Two Out Of Three Ain't Bad!" Re: Miko Romane...galleria di arte! So...how could we have this thread and not feature Carlo Ancelotti here? He spent eight years with us, a true wolf! 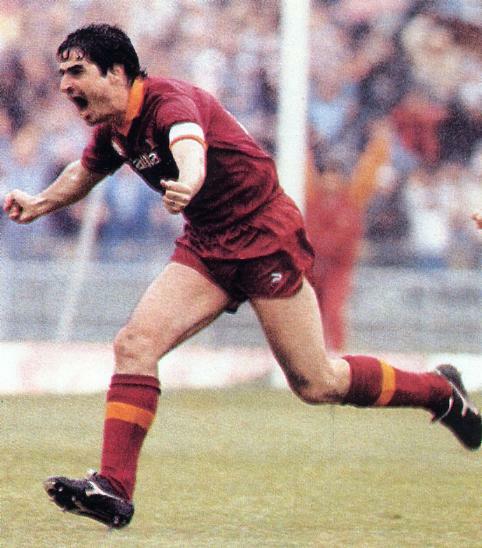 Carletto in his playing days reminded me somewhat of Marco Tardelli, a hard case who also had a good amount of skill to go with his physical presence. Carlo was less flambuoyant a character than Marco though, preferring to go about his work in a business like fashion and was therefore not always given the credit he was due. Nonetheless his time with us as a lupo included the highs of the Scudetto win and the despair of the European Cup final loss though he didn't play in that game. Carlo said in an October 2009 interview with sportmediaset.it. that one day he would like to return to Italy and become the manager of Roma, the only Italian club he would go to at this point in his career. He also said he would like to be Commissario Technico of the Azzurri but not for some time to come. Perhaps at different points in the future he will see both his dreams come true though I wouldn't like to guess in which order! The period of the late 1980s into the early 1990s while not being without some success was certainly troubled for us. Presidente Dino Viola had died and his wife held control until she could find someone suitable to buy her out. The least said about her régime and her decision to sell to Ciarrapico with his dubious activites the better! At the start of the 1990s our club was involved in an all-Italian UEFA Cup final where we lost 2–1 to Inter. 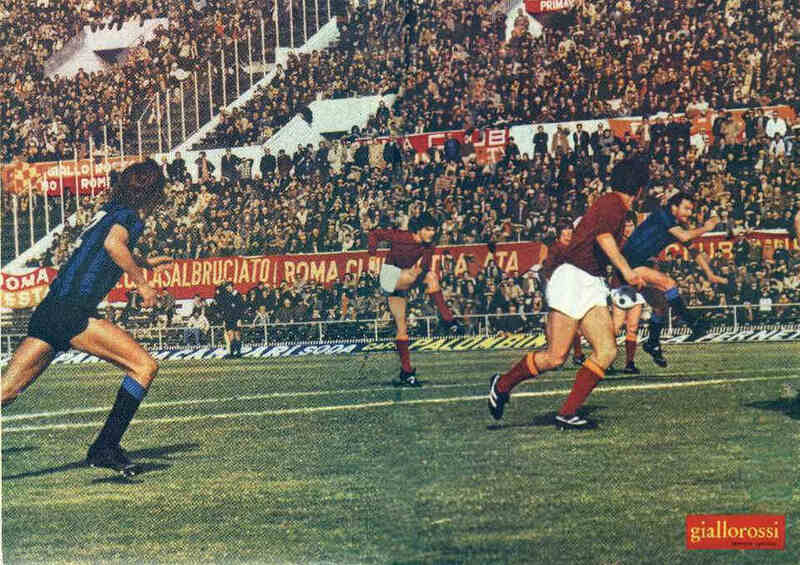 That same season we won our seventh Coppa Italia, and ended runners-up to Sampdoria in the Supercoppa Italiana. However we went through four different coaches in the five years 1988-93 before Carletto arrived to take charge. Spinosi was incompetent, Radice too conservative, Ottavio Bianchi (not to be confused with the bungling Carlos Bianchi in 1996) was certainly better but still not what we needed and Boskov could not do for us what he'd done for Sampdoria. We sure as hell needed Carletto in 1993. His arrival coincided with that of one of our best club owners, il vecchio (the Old Man) Franco Sensi. He must be featured here at a later date. Mazzone is the most experienced allenatore in Italian football, having coached more than 1000 professional matches. On March 18, 2006, he became the Italian manager who coached the highest number of Serie A matches ever, breaking the previous record held by Nereo Rocco. Roberto Baggio often defined him as being one of the very best coaches he had met and worked with in his playing career. Baggio in a radio interview (February 18, 2006) stated that Mazzone asked him to make a football comeback in Livorno where he(Mazzone) was the new coach. However, Baggio went on to say that much as he had wanted to accept the offer out of gratitude for what Mazzone had done for him, he was forced to refuse because of his physical troubles. Ringrazie Carletto...un altro romano vero! Last edited by Carlo Romano on Fri Sep 24, 2010 10:38 pm, edited 1 time in total. The film clip comes courtesy of "Avon," an acquaintance of mine who refers to Giannini as "grace on the pitch!" I saw a lot of his football skills (unfortunately all on tv) both for our lupi and for la nazionale. 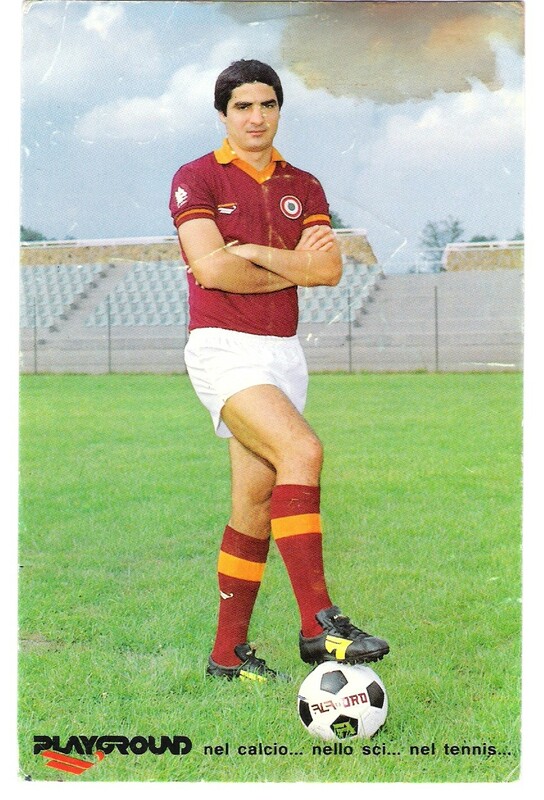 Totti often stated that as a young player he drew his inspiration from our Prince and he maintained a friendship with Giannini, even after his retirement, phoning him for advice. 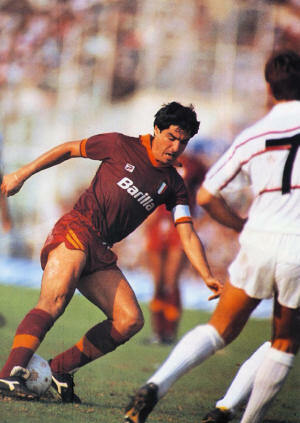 Totti has since become our greatest player but Giannini was indeed "The Prince!" All of these are from http://www.asromamuseo.com, a pretty spectacular website with a huge archive. You could spend hours on it. 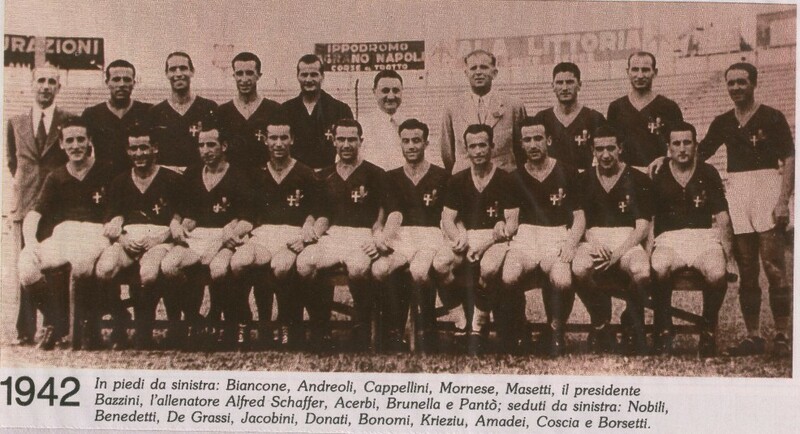 Here are official team photos off our scudetto winning seasons, 2001 and 1982, as well as the 1980's team. I done these myself using the original images I found on asromamuseo.com and doing a bit of work. I may do more in time. Click on them to make bigger. I also have these in high-resolution, if anyone wants them to get printed let me know here. The images from the 80's are actually better quality than the 2000 one.